The key theme that we found as we examined the trends in loan origination is diversification – platforms are evolving and maturing, lending different types of loan to different types of borrowers at a greater range of rates. This isn’t surprising, we probably didn’t have to do this analysis to know that, but exactly how this evolution and diversification is taking shape in each platform is interesting to observe and they are not all moving in the same direction. From their websites, one can gather that Funding Circle lends to businesses whilst RateSetter and Zopa lend mainly to consumers. 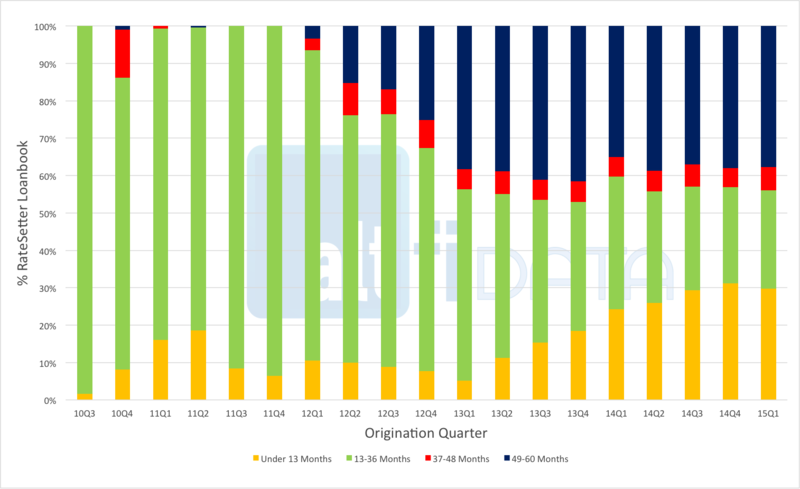 We’ve looked at who the platforms have been lending to each origination quarter since they launched. 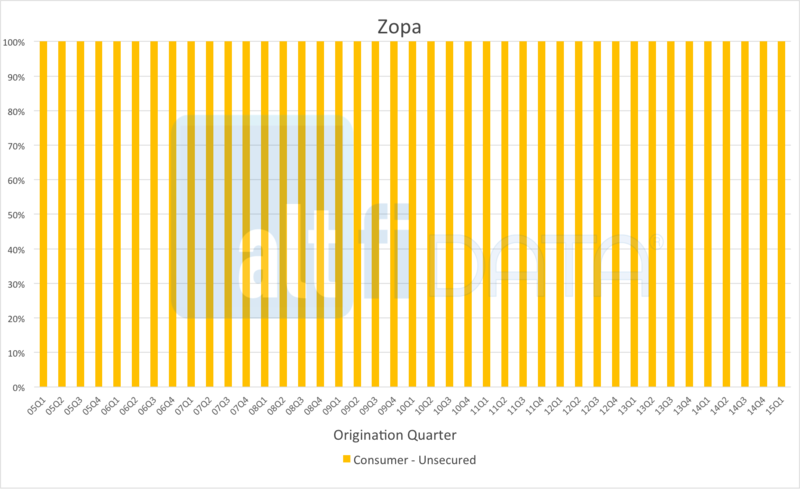 Zopa’s story is the most straightforward – for 10 years, it has lent to consumers on an unsecured basis (it has done a small amount of lending to sole traders, but this is classified as consumer lending in this analysis). If we then look at RateSetter, for the first 11 quarters of its lending, RateSetter lent exclusively to consumers on an unsecured basis. Then in mid 2013, the platform began to lend to consumers on a secured basis and has subsequently branched out into secured and, most recently, unsecured business lending. 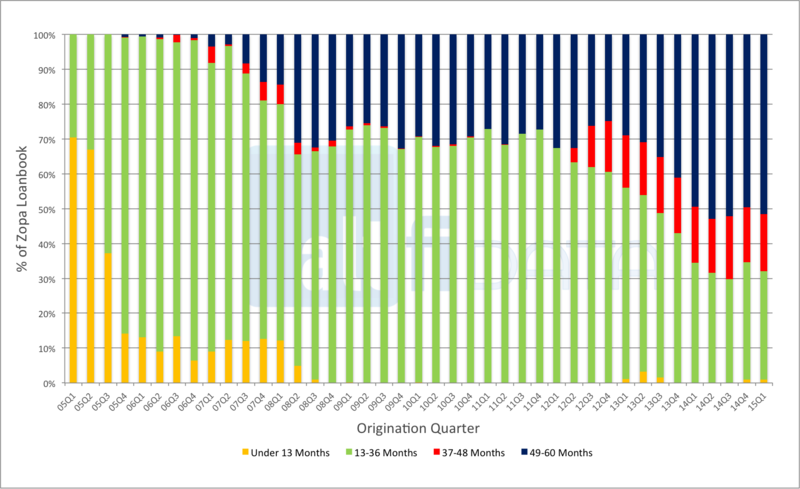 This diversification trend can also be seen in Funding Circle’s lending. The platform initially lent solely to businesses on an unsecured basis but secured lending is becoming an increasingly large part of its business, with 15% of last quarter’s lending being secured. The vast majority of this growth is driven by Funding Circle’s expansion into property backed lending. To get a feel for the riskiness and diversity of the lending of each platform, we looked at the weighted average interest rate that lenders received after platform fees and any contingency fund fees. It must be noted here that a direct comparison of the absolute level of this lending rate between platforms is not useful because of things like differing default rates and the existence of contingency funds or not. However, comparing the trends in lending rate between platforms is possible. All the platforms have remarkably stable lending rates since RateSetter and Funding Circle entered the fray in 2010. 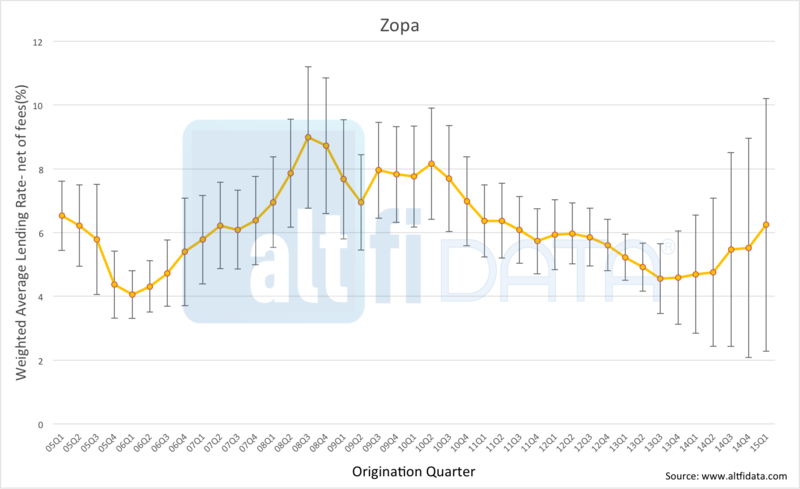 Prior to 2010, it is interesting to observe Zopa’s lending rate increase in the 2008/2009 period as the credit crunch set in. As a measure of the diversity of interest rates on loans made within the origination quarter, we have marked the standard deviation for each point on the chart. One standard deviation includes 67% of the population. The bigger the standard deviation, the more diverse the lending rates are. A larger range of lending rates could indicate a larger range of borrower quality (as one would expect lending rate to be reflective of borrower quality). It is interesting to note that the lending rate standard deviation of all three platforms has increased over time. This indicates a diversification of the loan books and could be as the platforms offer riskier loans to investors as their credit models are refined. Funding Circle, for instance, has introduced two new risk bands at the lower end of the credit spectrum since it began lending. Perhaps the most surprising observation about these charts, however, is the large increase in standard deviation seen in Zopa’s loan book over the last 2 years. The timing of this coincides with the introduction of Zopa’s Safeguard fund. This could indicate a change in lending strategy as Zopa attempts to maintain its pace of growth. 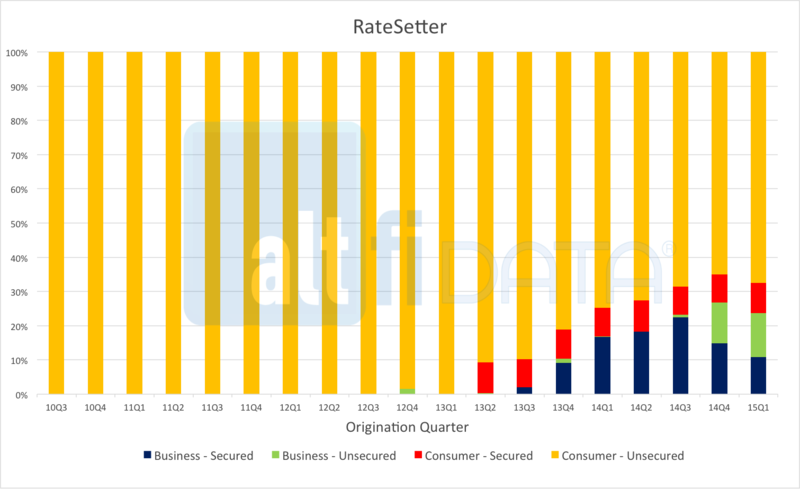 Those of you who are familiar with the rates that Zopa and RateSetter offer their lenders may be surprised to see Zopa’s mean lending rate higher than RateSetter’s, (as RateSetter currently offers lenders about 150bps more yield than Zopa on its 5yr rate). However this is explained when we look at the term of the loans which makeup the loan books with RateSetter’s loan book being weighted towards shorter term loans which will tend to have lower yields. 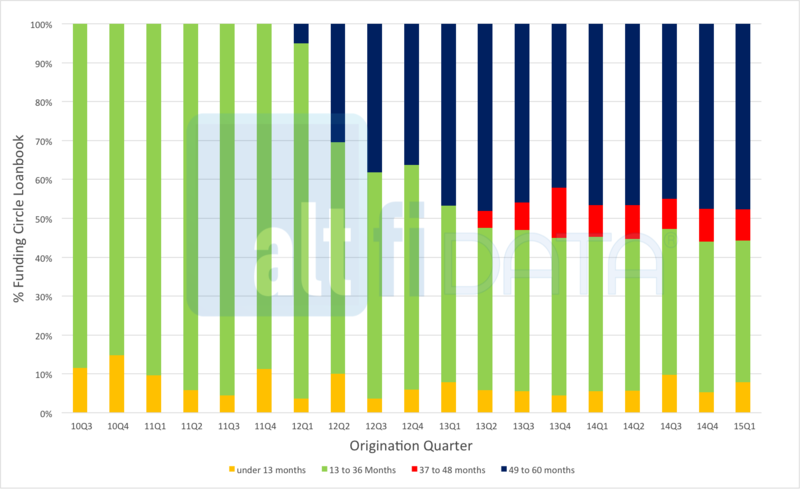 Taking a closer look at the terms of the loans in each origination quarter, it can be seen that all platforms started by making shorter loans and then moved into making longer duration loans. 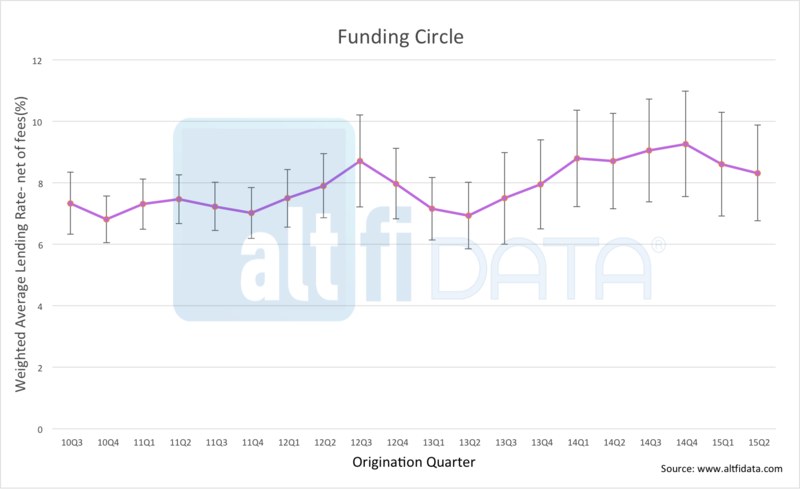 Funding Circle has had a surprisingly stable term composition of its lending over the last 2 years. We can see opposite trends, however in the Zopa and RateSetter loan books with Zopa’s proportion of longer loans increasing whilst RateSetter’s proportion of shorter loans is increasing - diverging strategies from the UK’s top two peer to peer consumer lenders.